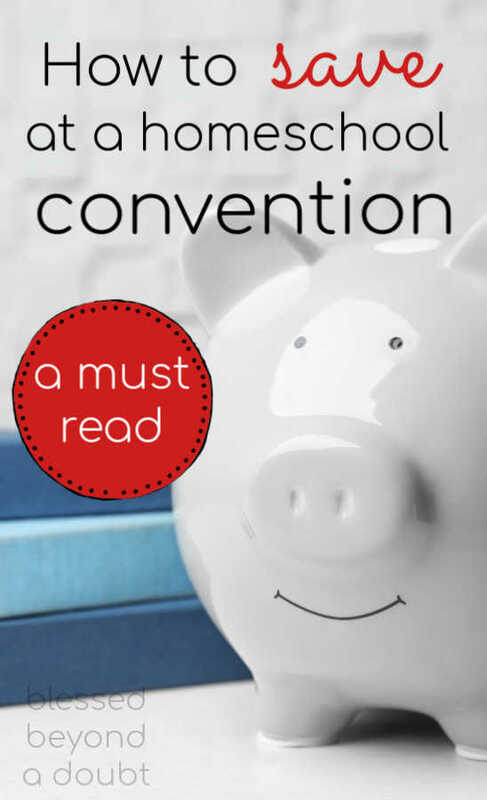 Homeschool conventions can get expensive, especially when you add up all the related costs of attending such as registration, hotel, travel, food, homeschool material purchases and more. It’s very easy to go over your budget if you forget to take some of these into consideration when you’re planning. Because of that, it’s good to get an idea of what you’re willing to spend for the weekend and book what you can ahead of time—look for discounts!—to help you stay on track. If you haven’t already, you should also create a shopping budget for the conventions you plan to attend. This will allow you to estimate your proposed spending at each and take it into consideration when you’re figuring out your total convention budget. Depending on when the convention will be taking place, you can start saving little by little. Every week or month, you can set aside some money in a fund such as a separate bank account, a Christmas club, a financial app like Acorns, or a change jar. It doesn’t really matter where, just as long as you’re saving. Registration—Register early and save money. Hotel costs—Are there discounts available? Occasionally, the vendor hosting the convention will hold a room block at a couple of nearby hotels. Travel—flying or driving? Make sure you take gas prices into consideration, as well as your car’s gas mileage. Taxi, Uber, or rental car costs? Materials you plan on purchasing? Your list may vary, but you get the idea. List every item you expect to spend money on and record an estimated amount before and the actual amount at the convention. Having this list with the actual spend will be helpful for future conventions. Honestly, creating the budget is the easy part—following your budget is where it gets tough. Once you see all the great deals available, your spending gear kicks in and all of a sudden you’ve spent your entire budget. You should always leave some cushion room in the budget for the cool things you find while browsing the booths that you didn’t take into consideration. Use cash instead of a credit card: Watching your money dwindle away is much more painful than using a card. Face up to your bad spending habits: Be honest and ask yourself if you’re impulse buying, or if the purchase you’re about to make is something you really need. Avoid spending triggers: Do you start getting jittery when you see a Starbucks? Avoid them and save $4. Rely on your budget buddy: As we said earlier, get support from someone who is naturally frugal. Educate yourself and prepare: The more you know about finances the better prepared you’ll be—and you can pass that knowledge on to your children. It’s understandable, you do want the best for your children but the overspending won’t help them. So, before you attend, write down the tools and materials you’re interested in and you can afford. Once you enter the convention, visit those vendors and ask questions. Test out their products, discuss their benefits and limitations, ask for product demos, and visualize yourself using these products. There’s no rush. If you think that their product is a smart purchase, go for it, otherwise, walk away. Many parents think about spending money at a convention but saving money is possible, too! For example, bring your own water bottles and snacks. If the hotel offers free breakfast, eat a healthy meal. Avoid the snack sections. If they offer free snacks then help yourself. As we stated earlier, register early and take advantage of any other savings promotions the convention company may offer. Here’s another helpful idea: Treat this like a business trip. If you worked for a business that frequented conventions, the employer certainly wouldn’t want you spending their money at expensive restaurants three times a day. They would probably prefer if you were thrifty with your expenses. Do the same for yourself. For instance, use a small refrigerator in the hotel room. If there’s a grocery store nearby, buy healthy energy bars, cold cuts, and bread for sandwiches, fruit, or any other goodies you may enjoy. Think about it, if you buy $12 worth of cold cuts and bread, you can easily make six sandwiches. If you bought six sandwiches at a local deli or restaurant, you’d pay five times that amount! Be frugal. Once you return home, review all your spending. Determine if you overspent or stuck with your budget. Jot down notes about how you can improve your money management in the future. Make this a detailed and honest report and have your children join in as well. They should take part in the whole budgeting process. It’s not only educational, but it is also a life lesson they can use for the rest of their lives. So, go ahead and enjoy the convention season. Just use self-control and limit your spending. That doesn’t mean you can’t treat yourself or your family on occasion—you can—you just have to plan for it. You’ll be thankful when you check your bank account and see that it’s not depleted when returning back home. Time4Learning.com is an award-winning, comprehensive curriculum for PreK-12th that makes learning effective and engaging through animated lessons and activities. The online program teaches and grades lessons, tracks, and records progress, and keeps reports to help simplify homeschool portfolios. For over a decade, Time4Learning has helped more than 500,000 homeschooling families with its flexible and engaging curriculum, resources, and more. Our team of homeschool moms, dads, and support staff have come together to create helpful insights on subjects such as family, education, fun, and more!